edited by Gerald R. McDermott. InterVarsity Press (Downers Grove, Illinois, 2016). The central assertion of “The New Christian Zionism” is that the covenant between God and the Jewish people is “irrevocable,” as St. Paul states in chapters 9 to 11 of his Letter to the Romans. A central part of this covenant is the giving of the promised land to the people of Israel. Thus, to affirm the ongoing reality of God’s covenant with the Jews is to affirm the legitimacy of the Jewish state of Israel not only as one nation among many under international law but as a nation with theological significance, from a Christian as well as Jewish point of view, however difficult it might be to articulate exactly what that might mean to various Christian theological traditions. It does not mean, in any interpretation, that the state of Israel cannot be criticized for actions that may be deemed unjust. Israelis, of course, criticize their government all the time, just as we Americans do with our own government. Christian Zionism so defined is something that many Catholics can agree with. 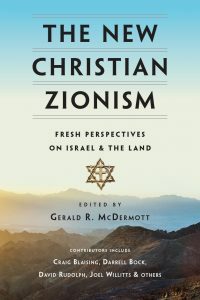 The various authors of the articles in this book go through Christian historical mistreatment of Jews, rightly condemning the idea that Christianity took the place of (superseded) Judaism, that the Christian covenant replaced the Jewish covenant. This false notion was prevalent throughout the Christian world until the mid-20th century, when Christian involvement in the Holocaust forced the various Christian traditions, each in its own way, to rethink and abandon the ancient Christian teaching of contempt for Jews and Judaism. The chapters go through in detail the biblical issues of the relationship between the Hebrew Scriptures and the New Testament and the affirmation of the relationship of people and land in the various books of the New Testament. The book delves into the theological and philosophical insights raised in mainline Protestant denominations, with one chapter devoted to Reinhold Niehbur. With one exception the authors of this book are Protestant and seem to presume the readers of the book are Protestants, so at times Catholics may have difficulty understanding it. There is virtually no mention of Catholic tradition on these issues in the 20th century or even the profound impact of the Second Vatican Council’s Declaration on the Relationship of the Church to Non-Christian Religions (“Nostra Aetate”), which in fact influenced many Protestant thinkers no less than worldwide Catholicism. In the conclusion of the first chapter, the editor quotes a positive 2002 statement about the state of Israel as that of the National Council of Synagogues. It was in fact, as the footnote admits, a joint statement with the U.S. bishops’ Committee on Ecumenical and Interreligious Affairs, a fact I remember well because I was the Catholic drafter of that statement. The sole Catholic author is a Catholic Maronite, Shadi Khalloul, who lives in Israel and rightly stresses the ancient ethnic and linguistic relations between Hebrews/Jews and Arameans, dating back to biblical times. Reading this article will make the book worthwhile for Catholic readers. Fisher is professor of theology at St. Leo University in Florida. I’m with Prof Rabkin, Zionism is Protestant and imposed upon Jews.